Think I’m putting the cart before the horse? After all, “Essential Entertainment” toyed with Outlander fans for years; EE optioned the books for a movie or tv series back in 2008. They worked with “Randall Wallace” (who wrote the movie “Braveheart”), and “Ann Peacock” (screenwriter for ‘The Chronicles of Narnia: The Lion, the Witch and the Wardrobe’ 2005 ) who actually wrote a screenplay for a feature film. We waited, and waited, and EE did nothing. Big fan? Faithful interpretation? Tell me more! Well I’m sold. Am I putting the cart before the horse? Maybe, but I don’t think so; Ron is backing up his words with action- that shows integrity, and Outlander deserves no less. I have complete faith in him. He’s obviously committed to making this happen and has proven to be MORE than qualified to handle the task of adapting our beloved Outlander books to a cable tv series. If Appreciating a Kilted Rump is Wrong Then I Don’t Wanna Be Right! I thought it was a good idea; instead of referring to Wedsnesdays as ‘hump day’ (the proverbial hill/middle of the work week), why not call it ‘rump day’ and show a man whose kilted cheek may be showing a little? Most of the ‘Rump Day’ features on Outlander Fan’s facebook page were pretty tame, not to mention verra popular (and for the record my page has always had a setting of 18 yrs old & older). We all looked forward to it, it really brightened up the midweek. This past Rump Day wednesday (7-11-12), as I was sitting by my sister’s pool & checking facebook from my smartphone, a warning notice in red popped up; it said something to the effect of ‘we have taken down this photo for its inappropriateness/if you wish to keep your page then remove all related content/visit this link for community guidelines.’ My first thought was, “Really? Someone COMPLAINED? Who in their right mind wouldn’t want to see men in kilts doing handstands (bums facing audience) on a stage?” My next thought was “Oh sh*t” and I hightailed into the house to get on my laptop to see what was going on. Yes, if you can believe it, ANOTHER chance to win a trip to Scotland! This one however, is only open to legal residents of the 48 contiguous U.S. and D.C. Here’s the link & good luck! 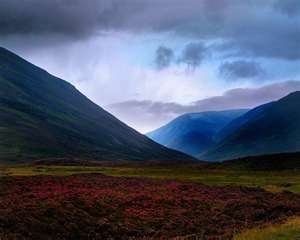 I just found out about another Scotland trip sweepstakes- this one is sponsored by Disney-Pixar’s Brave & VisitScotland. Here’s the link- Good Luck! ‘Diana Gabaldon made a couple of Very Interesting comments on Twitter in the last 24 hours. I’m not surprised, but I’m very glad to hear this, as I’m sure many of you are! Celtic Cowgirl is Having a Giveaway! Who doesn’t love a little Celtic bling? Can’t you just picture any one of the Outlander characters wearing these? 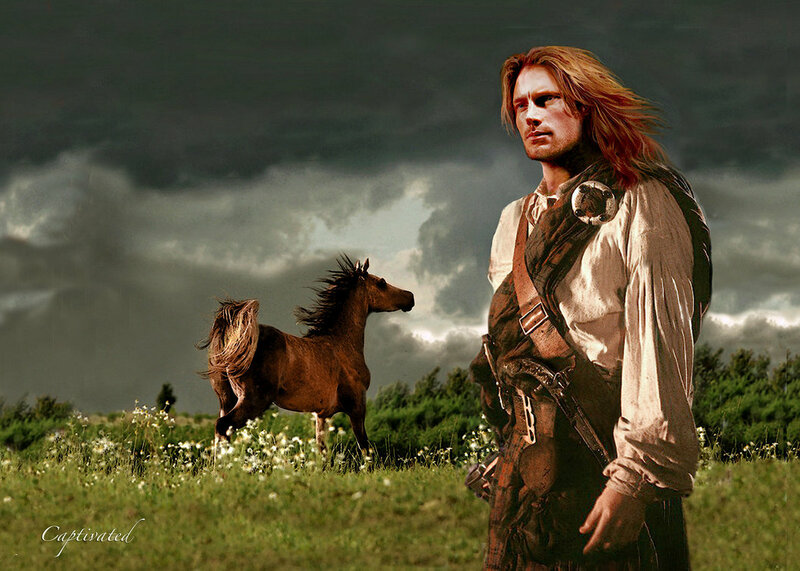 If you havena been to their website, Celtic Cowgirl makes “…Handcrafted Fashion Jewelry Inspired By The Celtic Influence Of My Scot/Irish Heritage And A Wee Bit By My Favorite Book Series Outlander.” AND they are having their first ever giveaway- all you have to do is “Like” their Facebook page, ken? Verra simple! 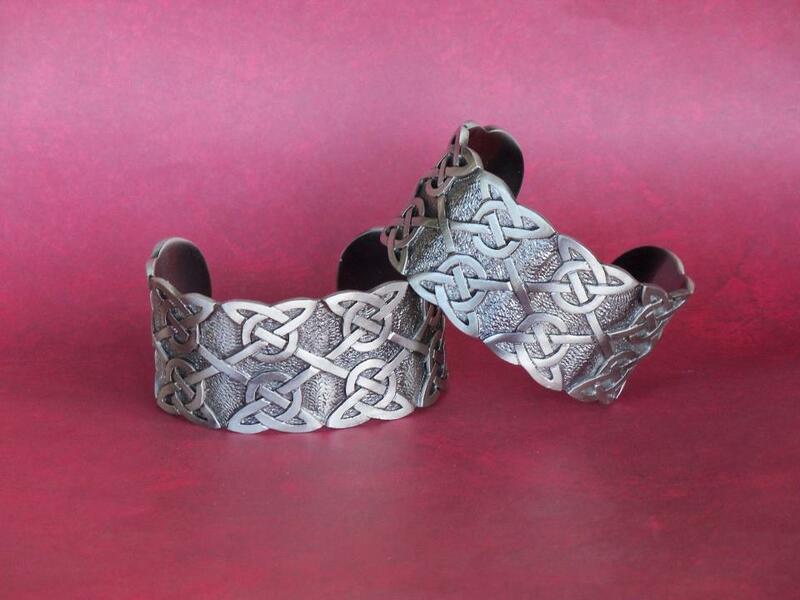 When the goal of 500 “Likes” is reached they’ll be giving away one of these bonny Celtic Knot Tribal Cuff Bracelets (pewter, featuring a satin-finish celtic interweave pattern slightly raised against a textured antiqued background, pictured above). 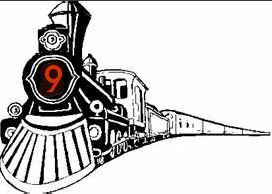 The winner will be picked with the help of a random number generator. Enter to win a 6-day trip to Scotland! I was less than thrilled when facebook changed our profiles over to the timeline format; I personally resisted until the last possible minute. (I still don’t think I know my way around it yet, not fully.) So you can imagine how I felt when they informed me that my *page* would soon be converted as well! Super. And that’s when I posted on other Outlander bloggers’ facebook pages asking for help in choosing between two cover photos for the new timeline format on my facebook page www.facebook.com/OutlanderFan. So many of you responded, I was so pleased and I’m happy to report that as of March 10th, 2012 ‘Scottish Thistle’ has the lead over ‘Dragonfly’ by almost 2 to 1! There’s just a wee problem (Heh-heh, you’re going to love this part, this is great): In my eagerness to share the pics that I presented to be voted on, I failed to take notice of their size. 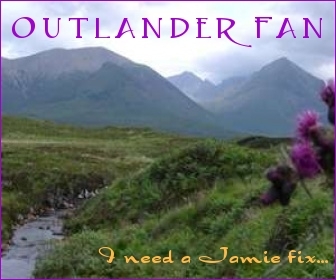 When I went to preview the cover photos, I was informed by the facebook gods that the pics were “too small.” Och, I thought (because it’s fun pretending to think with Jamie’s accent- you know you do it too) that’s no problem- I’ll just go back to the site where I made them & edit their size. Too easy. Well, guess what? The pics enlarged alright, but were blurry. Verra blurry, indeed… I feel like such an EEJIT! Enter to win a SIGNED, GIFT-WRAPPED Outlander 20th Anniversary Edition! Don’t forget to enter the OUTLANDER 20th Anniversary holiday giveaway! And best of all it’s signed by Herslef, Diana Gabaldon. They”ll be announcing winners on Friday/Dec 15th, so you have until the end of the day tomorrow to enter. Good luck to the lot of ye!